With our Egypt luxury journey, you will find the Egyptian history is like an enormous library; it is filled with more stories than anyone could know in a lifetime. Within every temple, mosque, fort and palace there are countless years of fascinating tales-involving Kings and Queens, magic and myth, births and deaths and battles. On this Egypt adventure we will reveal to you some of the most intriguing stories of this ancient land. Imagine yourself walking through ancient forts, marveling at ornate sculptures, gazing at enormous pyramids and watching the sunlight sparkling on the waters of the Nile. You will have a guide at your side, your interpreter for the rich array of symbols and mythology that will surround you. Egypt is a land that will enchant you and fascinate you, so get ready for your adventure! This is the ideal luxury tour for those who are interested in Egyptian history and want to see the temples of Luxor, the King Tut monuments and the Pyramids via land without taking a cruise down the Nile. Your experienced guide will take you on an Egypt luxury tour while teaching you all about the glory of the ancient Egyptian Kings & Queens. You will learn about the Pyramids of Giza, the Djoser step Pyramid, the temples of Karnak and Luxor and the tombs in the Valley of the Kings in the West Bank. Your guide is an expert in Egyptology, so if you have any questions about these periods in history or any aspects of Egyptian culture, you will be able to ask and receive a well-informed answer. You will come away with valuable insight and a deeper understanding of both ancient and modern Egyptian culture. The luxurious Egypt private tour will include transport in a private vehicle and a high knowledgeable private guide who is well educated, an English speaker and an expert in Egyptian history. 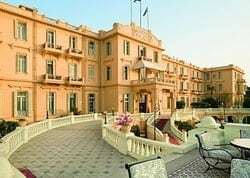 You will stay in some of the most luxurious hotels in the region, including the elegant Mena House next to the Pyramids and the stunning Old Winter Palace in Luxor. You will also spend a private evening dining at a traditional Egyptian restaurant and discovering some of the traditional food and drink of this culture. 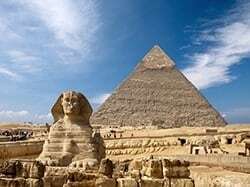 The Egypt travel package will also include accommodations, entrance fees, internal flights, taxes and more. You are free to choose the itinerary that we have put together, or create your own itinerary from scratch at no additional cost. To find out more about this wonderful tour and all of the other Egypt private tour experiences we have to offer, you can feel free to contact us at any time. Enjoy private tour package with a private Egyptologist guide, driver, traditional Egyptian cuisine, and all internal flights. Your tour will be customized for you and will suit your needs and your schedules. Avoid the crowds with your own private qualified guide during your private tour around the Great Pyramids. Discover the history of the East & West banks of Luxor in luxury private tour. 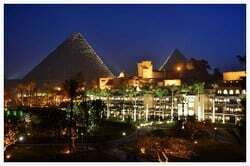 Winter Palace in Luxor, and luxuries Fairmont Nile City in Cairo. You will be greeted with a smile upon arrival to Cairo airport by a friendly tour representative. Our representative will facilitate Egypt entry visa process on your behalf, visa fees is included. A private transfer between Cairo airport and Mena house hotel will be provided. Mena House is a beautiful and unique hotel in Cairo, with its own rich and colorful history. Fascinating guests have frequented the property since 1869 and it has continuously held the attention of royalty and political thinkers. This palatial hotel is located in the shadows of the Great Pyramids of Giza in Cairo and it is surrounded by 40 acres of verdant green gardens. The royal history of the hotel is reflected in luxurious interiors that are embellished with exquisite antiques, handcrafted furniture, original works of art, and magnificent antiques that are rarely found in luxury hotels. Mena House has played host to kings and emperors, heads of state, and celebrities. Located 700 meters from these wonders of the ancient world, Mena House offers unmatched views of the pyramids. You can gaze upon the magnificence of the pyramids from your room, watching the sun rise and set over these legendary monuments. After dinner at one of the many restaurants, you can return to your room and see them lit up for your private viewing pleasure. An ideal location for meetings in Cairo, the hotels banquet and conference center offer venues for weddings, receptions, and meetings ranging from 50 to 1000 guests. Recreation options at the hotel include a heated swimming pool, and a fully equipped spa & fitness center. Regarded as one of the leading luxury hotels in Cairo, the hotel combines the magical charm of a bygone era with unrivaled service fit for royalty. Your interlude at the hotel promises to be a journey of discovery, exploring Cairo’s ancient treasures and unraveling the many mysteries of Egypt’s past. 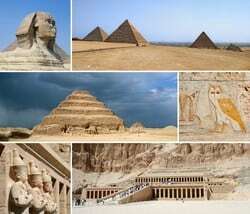 Enjoy this customized guided tour, which explores the Great Pyramids of Egypt, ancient Memphis, Saqqara, the Solar Boat, Chephren Pyramid, and the famous Sphinx. 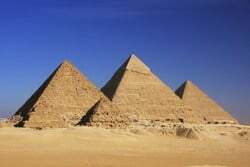 You will visit the legendary Great Pyramid, the largest one of the Giza group. After visiting the Great Pyramids, head to Memphis with your private Egyptologist guide. There, you can see the 34 ft. statue of the most famous pharaoh, King Ramses II. Ramses II ruled Egypt for almost 67 years during the new kingdom. Then we will take a private tour to the Saqqara monument, which is a must-see attraction in Giza. Enjoy the step pyramid for king Djoser; it is 4,500 years old and 200 feet tall. Lunch at a great local restaurant is provided after visiting Saqqara. In the afternoon, it is time for a new adventure and unique experience, as you will be picked up before sunset from the Mena House hotel to travel to the desert. Your private guide will lead you on your choice of camel or horse, where you can enjoy watching the sunset with a panoramic view of the Great Pyramids while exploring in the Sahara desert around the Great Pyramids and Sphinx. After the Sunset camel or horse back ride, enjoy a delicious dinner at one of the most famous Bedouin restaurants. Transfer in a private vehicle between the Mena House hotel and Cairo airport is provided. Osiris Tours representative is provided for airport assistance. Flight from Cairo to Luxor is provided. An airport transfer with a private vehicle from Luxor airport to the Winter Palace hotel is provided. After arrival to Luxor, enjoy a private custom tour of the fascinating and historic East Bank of Luxor with a qualified Egyptologist guide. Your guide has the education, experience and knowledge of Egyptian history to give you a fascinating insight into the historic sights you will be seeing. 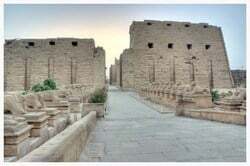 You will start by visiting the Karnak temple. Walk along the Sphinx Avenue to enter the complex, as your guide explains how the massive facade was constructed and how they used the Sphinx Avenue for the Opet Festival. Karnak Temple is considered to be more than just a temple; it is an open museum and the largest ancient religious site in the whole world. It was built for the sacred Theban triad, God Amun Ra, his wife Goddess Mut, and their son, God Khnsu. 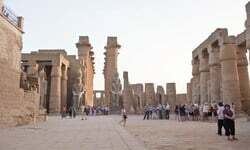 Continue to Luxor Temple, which was once joined to the Temples of Karnak by a one-mile long Sphinx Avenue. Luxor temple was built by the king Amenhotep III, who died before he finished it. King Ramses II then completed it and built his massive statues by the entrance of the temple. The Sofitel Winter Palace Luxor is a 5-star luxury hotel built in 1886 by British explorers and perched on the Nile River amid luxuriant tropical gardens and ancient temples. This opulent Luxor hotel blends rich colonial design with the glory of Pharaonic times. The palace was once a retreat for the Egyptian Royal Family in the 19th century. In the Winter Palace hotel, Agatha Christie wrote her famed 1937 novel Death on the Nile. Illustrious dignitaries – from presidents and politicians to artists and celebrities – have stayed in the sumptuous suites overlooking the Valley of the Kings. Archaeologist Howard Carter, discoverer of Tutankhamen’s tomb, wandered the gardens of this sumptuous hotel in Luxor almost a century ago. 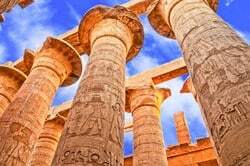 With your private Egyptologist guide explore some of the most incredible sites of the country. 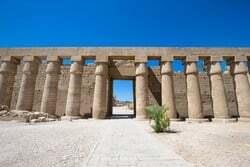 Your custom private tour will take you to the Queen Hatshepsut temple. Queen Hatshepsut was the most famous, intelligent, and powerful woman in ancient Egypt. She ruled Egypt for 20 years during the New Kingdom time (15th Century B.C. ), she is considered one of the most successful pharaohs in Egyptian history. Hatshepsut was the daughter of King Thutmose I and the wife of Thutmose II (he was also her half-brother). Hatshepsut married her half-brother Thutmose II, whose mother was a lesser wife, in a common practice that was meant to ensure the purity of the royal bloodline. Thutmose II died after a 15-year reign when Hatshepsut was 30 years old. After the death of her husband, Hatshepsut had to share the throne with her stepson, King Thutmose III. Hatshepsut served as his regent. Initially, Hatshepsut bore this role traditionally until, for reasons that are unclear, she claimed the role of pharaoh. She began having herself depicted in the traditional kilt and crown, along with a fake beard and male body. This was not an attempt to trick people into thinking she was male; rather, since there were no words or images to portray a woman with this status, it was a way of asserting her authority. Hatshepsut’s success in transitioning from queen to pharaoh was remarkable due to her ability to recruit influential supporters. Senemut was her favorite and most important advisor; he is the one that designed her beautiful temple of Senenmut in the West Bank of Luxor. He had been among her servants when she was queen and rose with her to power (and some speculate he was her lover as well). Head to the Valley of the Kings where you will have the chance to explore three tombs. These tombs were constructed here for the kings, including King Tut, and powerful nobles of the New Kingdom (the Eighteenth to the Twentieth Dynasties of Ancient Egypt). In the Valley of the Kings, you will be able to learn about the reign of King Tut and the secrets of his tomb. King Tut still has not given away all of his secrets yet. As the boy king, King Tut was very famous and his region was one of the most documented regions on the walls of Luxor temples and tombs. Here are some more facts about King Tut: His father, King Akhenaten had a major issue with the priests of Thebes (Luxor) during his life. King Akhenaten is the first and only king who rebelled against the main god during the New Kingdom, god Amun Ra. When Akhenaton (King Tut father and husband of Nefertiti) had his religious revolution against God Amun Ra, the priests kicked him out of Thebes and he had to leave to a new capital. King Akhenaton moved to Tell Al Amaran, which is located about 300 miles north of Luxor. When King Akhenaten had to leave, his wife Nefertiti left with him and they both lived there worshipping the new god Aton, while he was there his second wife Kiya gave birth to King Tut.When he was born, he was called Tut Ankh Aton (after his father new God Aton). When king Akhenaten died, King Tut changed his name to be Tut Ankh Amun (after the God Amun Ra name. He returned to Luxor and returned the glory back to Amun Ra, which is why he changed his name to be more related to him. 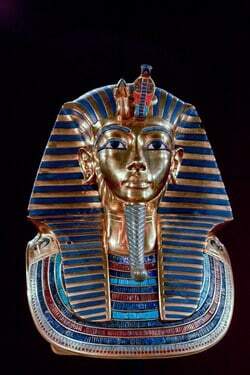 King Tut was 9 years old when he took over because he was the only son of his father. Because he was such a young king the priests played a major role in the political life then. The Ancient Egyptian documented his region to show his loyalty to God Amun Ra and tried to fix what his father had ruined. Finally, the tomb of King Tut is the only one that was not robbed because it is located underneath of another tomb, tomb of King Ramses VI. The tomb robbers didn’t look there because they never expected there to be a tomb underneath another tomb. That’s why King Tut’s tomb was untouched until Carter found it in 1922. After visiting the Valley of the Kings and King Tut tomb, head to the Valley of the Queens in a private tour with your own Egyptologist guide. Private transfer with a private vehicle from the Winter Palace hotel to Luxor airport is provided. Private transfer with a private vehicle from Cairo airport is provided. After arrival to Cairo, discover the Egyptian Museum of Antiquities and its Mummy Room with your private trained Egyptologist guide. During your private tour to the Egyptian museum, learn about the history and collections of this great antiquities house. His impressive collection dates back to T1830. Enjoy a private tour of the gallery of King Tut on the upper floor. Howard Carter discovered these remarkable artifacts from the tomb of the boy king in 1922. 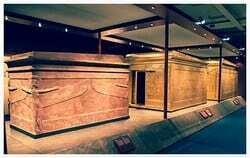 There are 3000 pieces, including a famous gold funerary mask and coffin. During this evening custom tour visit Khan El Khalili, where you will be transported back in time to an old Arab Souk. Enjoy shop owners calling you to their stalls, the scent of spices, the hustle and bustle of trade, and the many beautiful objects that can purchased will have you lost among alleys for hours. There is a big spice market there where you can buy fresh spices of any variety. Walking through the bazars of Khan El- Khalili is such a fun experience and it is not to be missed even if you are not looking to buy anything. After the tour, enjoy a delicious Egyptian dinner at a local restaurant. A qualified private guide, a private vehicle, and private driver are provided. With sweeping panoramas of the Nile River, and views of the Pyramids in the distance, Cairo’s natural beauty and ancient history are always in sight from Fairmont Nile City. Added to this panoply of wonders are special features such as culinary adventures at the city’s finest restaurants. Transfer in a private vehicle between the Fairmont Nile City hotel and Cairo airport is provided. Osiris Tours assistance in Cairo airport is included. Located 700 meters from these wonders of the ancient world, Mena House offers unmatched views of the pyramids. 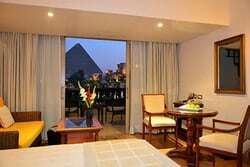 You can gaze upon the magnificence of the pyramids from your room, watching the sun rise and set over these legendary monuments. After dinner at one of the many restaurants, you can return to your room and see them lit up for your private viewing pleasure. An ideal location for meetings in Cairo, the hotel’s banquet and conference center offer venues for weddings, receptions, and meetings ranging from 50 to 1000 guests. Recreation options at the hotel include a heated swimming pool, and a fully equipped spa & fitness center. Regarded as one of the leading luxury hotels in Cairo, the hotel combines the magical charm of a bygone era with unrivaled service fit for royalty. Your interlude at the hotel promises to be a journey of discovery, exploring Cairo’s ancient treasures and unraveling the many mysteries of Egypt’s past.